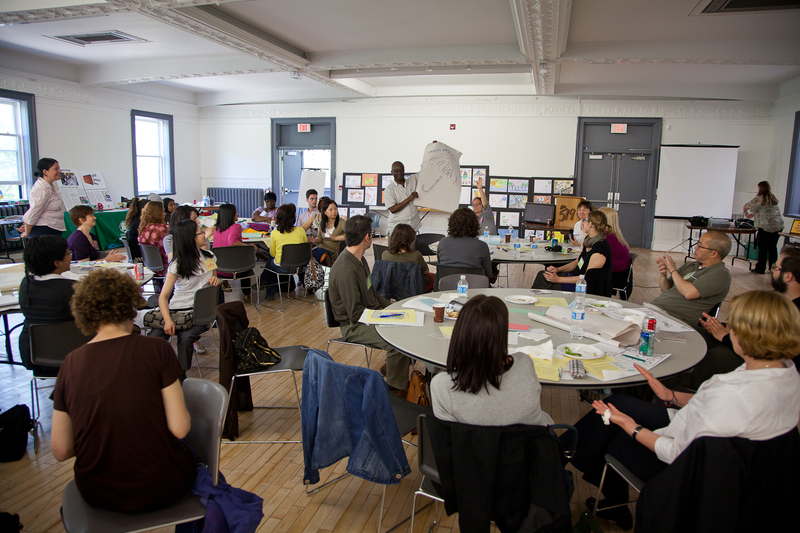 On May 4th I was lucky to attend Toronto Neighbourhood Centres (TNC): Telling our Tales. The forum was held at 519 Church in a well chosen setting boasting high ceilings, round tables, and described by speaker John Stapleton as “a neighbourhood…there’s a little bit of chaos to it”. Representatives from over 20 community agencies attended, and short sessions showcased the variety and depth of arts based work going on at Neighbourhood Centres across our City. Through this meeting, a few ideas stuck out for further exploration. How do you get more people through the front door and engaged in “transformative” programming? How do you get away from using words like “transformative” to describe the very personal stories that actually do this work justice? The first (again quoted from Stapleton) is that we need to stop talking to ourselves. How do we get people who aren’t engaged in neighbourhood centres to come out and use resources available to them? How do your express impact to policy makers? This idea was further supported by Rob Howarth of TNC as he discussed how to develop city wide recognition, as people who don’t use Neighbourhood Centres often don’t even know they exist. How do you get more people through the front door and engaged in “transformative” programming? How do you get away from using words like “transformative” to describe the very personal stories that actually do this work justice? The second issue was the continuous challenge of funding and how to develop awareness with little budget for advertising and outreach. Entrepreneurs from Collectivity are working on this with TNC and described the energy within the room as “raw and wild”. 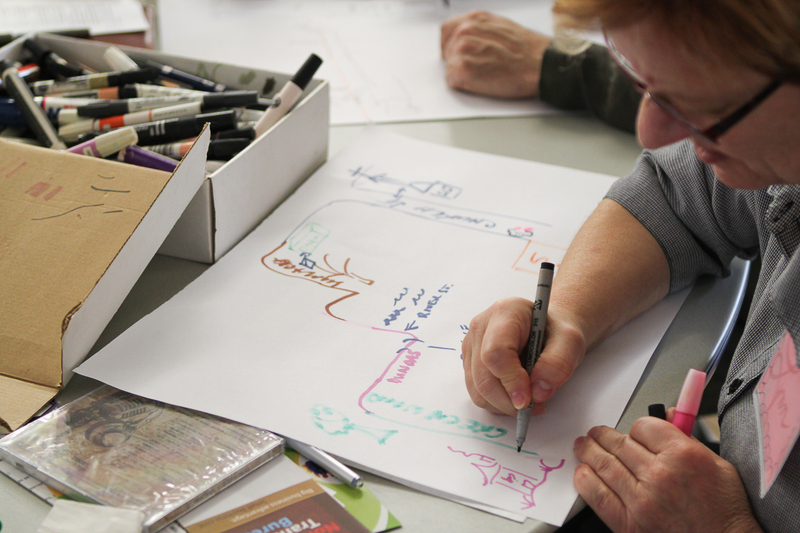 While much brainstorming went on to expand upon this issue, the main task remains to develop a method to encourage those who aren’t engaged in Neighbourhood Centres to care about their work. What struck me most throughout the day were glimmers of innovation from several groups embarking on social enterprise. Fred Victor’s community garden makes calendars, recipe books, and sells small prints of photographs and drawings splitting commissions 60/40 to pay both the artist and program. The Christie Ossignton Neighbourhood Centre’s L.O.F.T youth program provides t-shirt design, graphic design, and sound recording services to help market and promote the work of it’s young artists and programs. The storefront model also is gaining popularity to develop street level space visible to passersby providing a physical setting to capitalize on creative work. This local showcase is important to create a presence and attract those who may not otherwise open the door to a Neighbourhood Centre. It’s a way for potential members/clients/participants/stakeholders/residents to see what’s going on, and put a face to something they might not be familiar with. These small ventures were just few of what could be many ideas to better support community programming and participants. So often frustration in community work is found in the continuous challenge of funding. Being *dare I say* creative is one way to take the first step towards stability. This entry was posted in Ideas and tagged Collectivity, community development, Fred Victor, John Stapleton, L.O.F.T, Rob Howarth, social enterprise, storefront model, Toronto Neighbourhood Centres by Neighbourhood Arts Network. Bookmark the permalink.